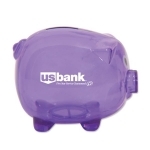 Save more by bulk ordering classic piggy banks! 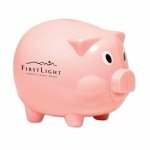 Encourage your young customers to save their money in these personalized classic piggy banks imprinted with your brand slogan or logo. 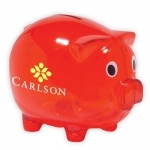 These piggy banks are classic promotional gifts and pack high emotional quotient. 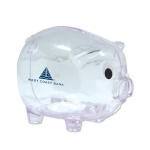 Both young kids and their parents will appreciate personalized piggy banks because they serve as a table trophy as well as an inspirational savings bank. Free artwork assistance, free online design proof and fast turnaround time keeps us ahead of our competitors. 100% Customer satisfaction guaranteed. Available at guaranteed low prices, we can beat the price by further 10%! 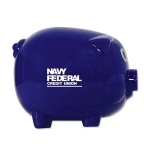 You can Bank on these Custom Printed Classic Piggy Banks to Get Noticed! 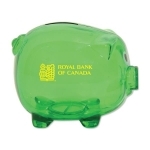 Custom classic piggy banks indeed make a great giveaway because grown-ups, elders and kids will love them. These piggy banks can be creatively utilized for various purposes other than just storing money. Parents and teachers can happily choose them during home lessons or classrooms for simplifying various principles of mathematics. 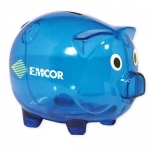 These piggy banks are perfect to take your promotions back to days when no bank accounts, full-time jobs, retirement funds and mortgages existed! There is hardly any occasion when you cannot think of giving any of these custom piggy banks. Be it a tradeshow, school event, annual day event or any event, you can choose to gift away any of these customized piggy banks as acknowledgment token or inspirational gift. Schools, financial institutions, educational facilities, teachers-parents unions and all others who care about kids and wish to make them responsible citizens can select these piggy banks as gifts. 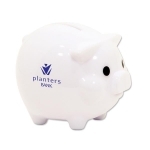 Your recipients will love to put their money in these impressive piggy banks and with every deposit they will be reminded about the old saying that every penny counts. 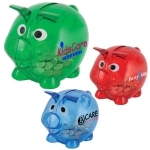 By giving away these custom piggy banks for kids, you will be attempting two tasks which are inspiring kids to save and attracting their parents to your business. 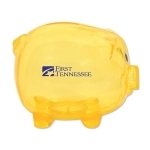 These piggy banks are perfect for handing out individually or as a combo with many other budget priced and purposeful promotional giveaways for kids. 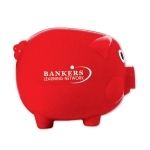 These personalized classic piggy banks will comfortably rest on most desks and continue to remind users about their responsible behavior with money. 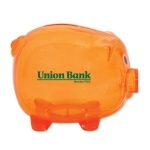 You can seek this personalized moneybox in a color of your choice and get them customized with your logo or slogan prior to distribution. If you are confused about the right choice, imprint options, suitable colors or anything about these custom coin banks for your next event, feel free to reach out to us at 855-454-3786 or email us at info@promo4kids.com.